Reverse Osmosis and Ultrafiltration are offered as on-site services in New Zealand exclusively by Vintech Pacific. Both services employ reverse osmosis technology but use membranes of differing pore sizes, which enables a wider range of quality enhancement results to be achieved. Membranes used for reverse osmosis have a 120-250 molecular weight cut-off (120-250MWC) depending on the target molecule, while those used for ultrafiltration range between 10,000 and 100,000 molecular weight. In addition, for reverse osmosis, the permeate stream may also be passed through a treatment media before being recombined with the retentate to minimise volume losses. 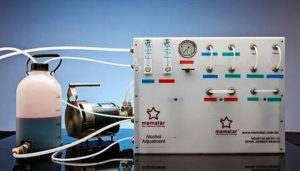 • Remove Brettanomyces taint compounds (4-EP and 4-EG). • Remove smoke taint compounds. • Remove water from grape musts. Aside from its versatility in fault remediation, wines concentrated by reverse osmosis show improved weight, volume in the mouth and robustness of character. • Remediate browning in white wines. • Improve depth and density of colour in reds. • Improve texture and concentration. The use of fining agents for example, indiscriminately removes valuable phenolics, which can result in loss of aroma, mouth-feel and varietal character. Use of these agents also results in higher volume losses due to the lees they create. 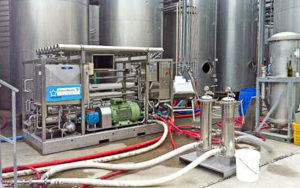 In contrast, ultrafiltration minimizes these losses while producing valuable by-products in the permeate stream, which can be used to enhance quality in other wines. This technology is especially helpful in cooler growing seasons where colour concentration is below normal, as it also increases the colour and depth of the wine. In addition to the ability to selectively adjust their organoleptic qualities, wines concentrated by ultrafiltration show improved weight and volume in the mouth yet retain their elegance. Typically, quality increases dramatically with about 5–10 percent concentration. With ultrafiltration, only a portion of the wine may need to be treated to economically improve the quality. 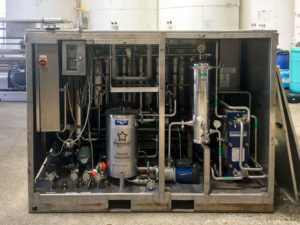 Both technologies can be accurately demonstrated on-site, using a five-litre sample of the wine to be treated, with our Microstar mobile laboratories. Based on the outcomes observed with the Microstar lab and the winemakers’ tastings, clients can decide whether and how to proceed with using full-scale reverse osmosis or ultrafiltration technologies – in other words, you can try before you buy! Between reverse osmosis and ultrafiltration, there are simply no other quality improvement methods that offers so much versatility. To discuss how Reverse Osmosis or Ultrafiltration can help to enhance your wine’s quality, call Vintech Pacific.